Happy World Card Making Day from all of us here at Taylored Expressions! We want to help you celebrate with a challenge, some gifts and our latest release! The Taylored Expressions WCMD Challenge - Create at least one card today featuring TE stamps and mail it out to someone - not for any particular ocassion, but just to make them smile! Post a photo of your creation on your blog or to an online gallery and come back to this post and leave a comment that includes a link to your card. Your comment (only one per person please) will enter you into a drawing for any one Taylored Expressions Stamp Set of your choice! How cool is that?! You have until Sunday night October 4th at 11 pm PST to enter. The winner will be announced sometime Monday right here on the SASI Blog. Free Digi-stamp from TE - Head over to Taylor's blog anytime after 8am PST today to access a free downloadable image for the back of your holiday cards. Gift with Purchase - today only when you place an order in the TE Store by 11pm PST tonight you'll receive a FREE kit to create a card like the one pictured below (ribbon and stamped image not included). Just add your own ribbon and any stamp for a totally cute and super quick card! Sample below features Fresh Flowers. Holiday Stamp Set Release - at 8am PST today TE will release our 3 new holiday stamp sets along with our Christmas Key Ingredients and MORE! You can get all the details on Taylor's blog and in our Newsletter. If you're not subscribed yet to receive our newsletter, you can sign up over in the sidebar to the right. Stamping, shopping, stamping! We hope you enjoy World Card Making Day! Happy World Card Making Day! Here is my card for this challenge. Thanks!! As I look at the photo (which isn't very good -- bad lighting right now... Sorry! ), I realize this card might be a little cuter with a little polka-dot border as a frame around the outside. I don't think the recipient will mind, though! Here's my card for the challenge. I also incorporated this week's sketch challenge into the card. This is going to my new friend, Pat. Hi Everyone! I hope everyone had a wonderful WORLD CARD MAKING DAY! 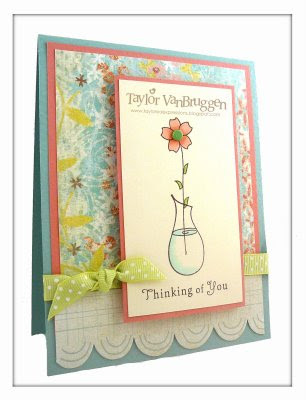 Here is my card for Taylor's challenge using Fresh Flowers. Hi and thanks for a fun challenge. I enjoyed making a just because card. Here is what I came up with. I made it for my hubby. I know it probably isn't the most embellished card in the world, but it is for my hubby who is deployed overseas and he prefers simplicity. Aard making is really fun. I would love to make fabulous cards.